In this delightful tapestry 'Verdure aux Oiseaux' we see a typical verdure scene which was so popular in the 17th and 18th century as pieces of art inspired by nature. Here we behold a scene of the countryside along with houses, bridges and 2 birds in the foreground. This piece is exceptional in its detail in the tree trunks and foliage as well as its particularly well balanced composition and color scheme of blue greens for the foliage and yellow, mustards and browns for the rest of the landscape. This piece brings the beauty of nature to any room or home. 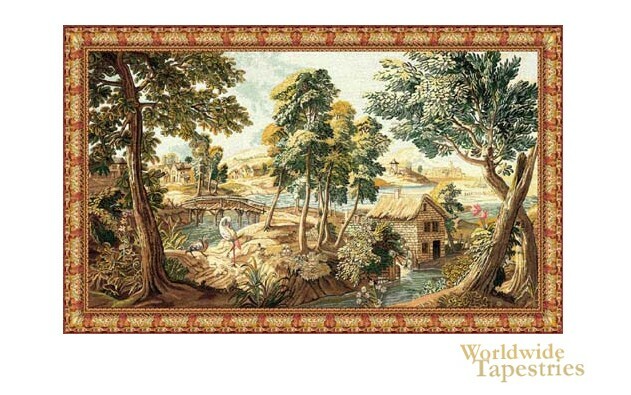 This tapestry 'Verdure aux Oiseaux' is lined and has a tunnel for easy hanging. Dimensions: W 53" x H 32"